It's been a while, but I've finally finished my broadfall trousers! The heat wave we've had for the past two weeks, on top of other projects, has kept me from working on these - there's nothing like sewing with a heap of heavy wool serge in your lap when it's 97 and humid. No thank you. 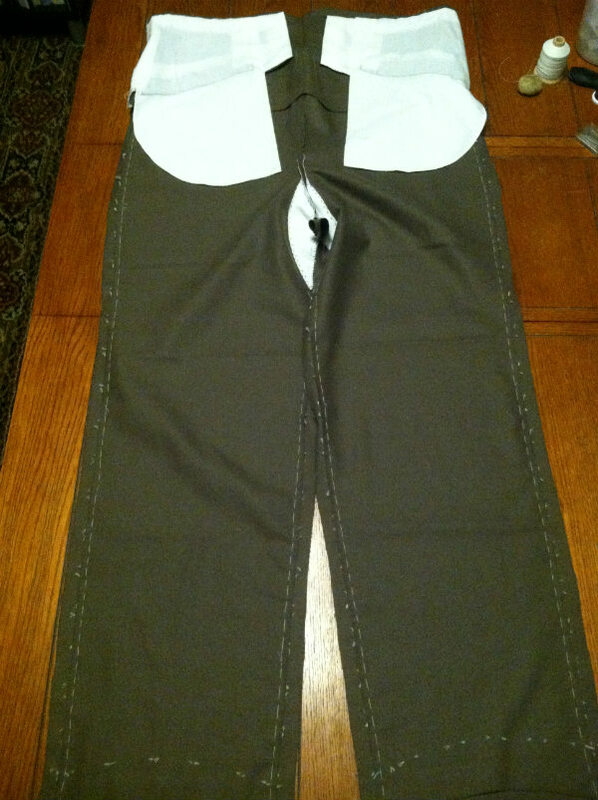 With the pockets finished, I could sew together the fronts and backs. Here you see everything basted together, ready for sewing the long seams. You can see here how the added inlays are dealt with. 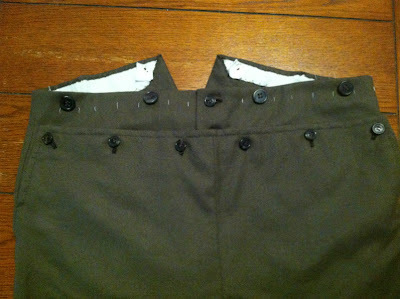 The backs have added material for adjustment and size increases. 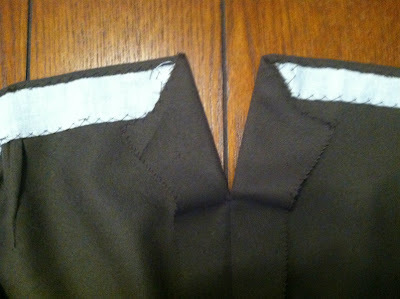 The inlays are marked with thread tailor tacks, and this line matches with the edge of the fronts. I then know to sew 1/4" inside of that line. 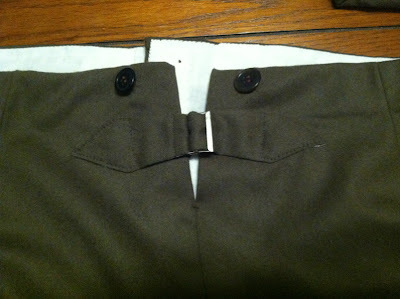 Based on the rear view of these trousers I decided to widen the "V" at the back waist so I can add an adjustment strap. I didn't bother to change the cut, but just folded back more material and pressed. 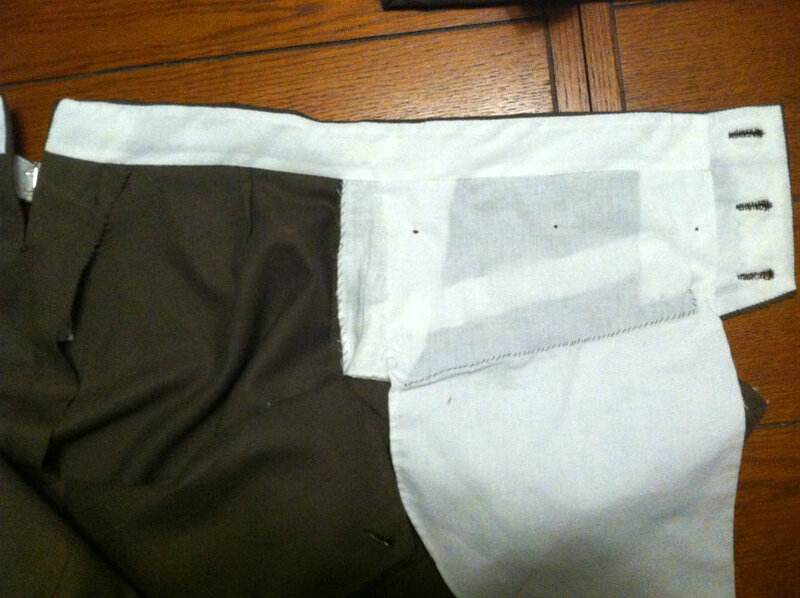 I later shrank out the little ripple of cloth that bubbled up because of the additional fold. 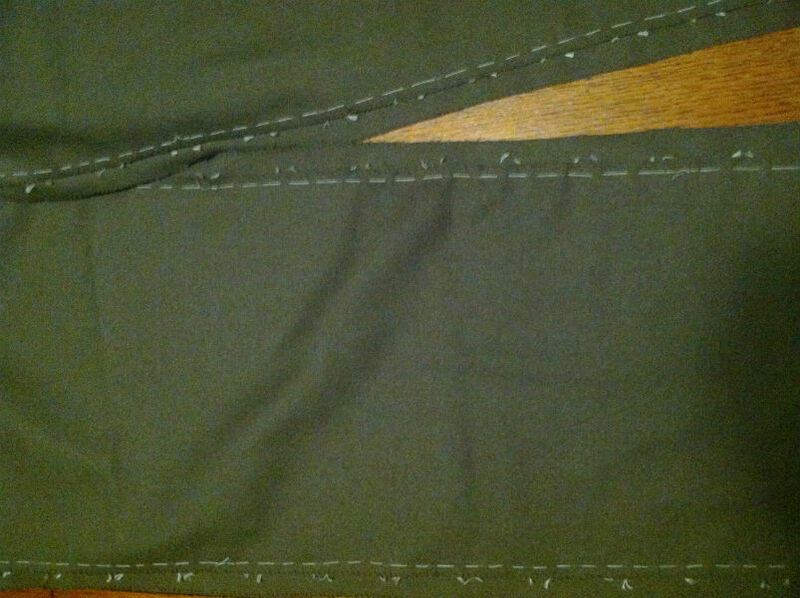 On the outside I made a bar tack to keep the V from tearing open. 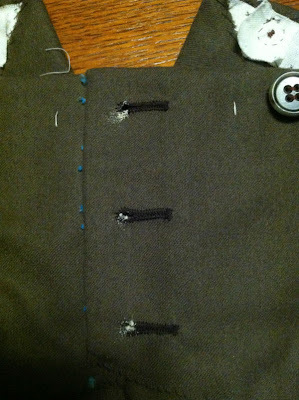 Sewing on suspender (braces) buttons, I added a bit of extra linen inside to help support them. 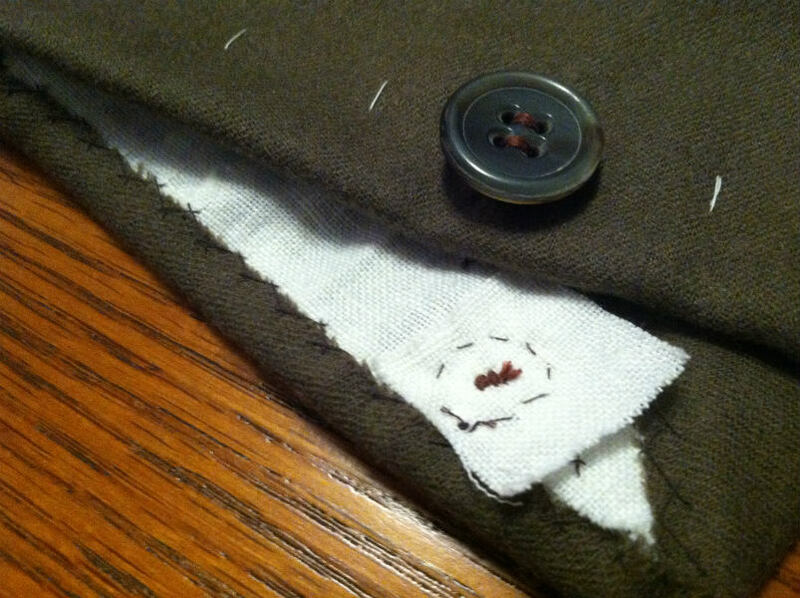 I side-stitched the linen in place, then sewed on the buttons. 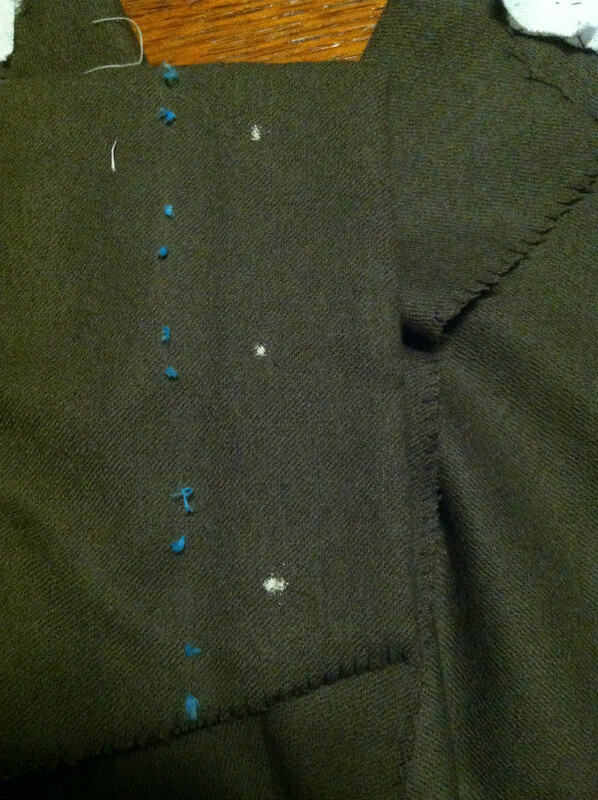 The bearer buttonholes, in 3 different stages. 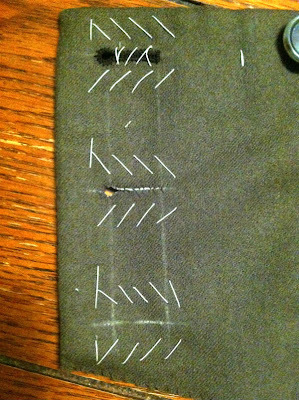 The top buttonhole is completed and basted shut, the middle one is cut and whipped, and the bottom one is marked out for cutting. 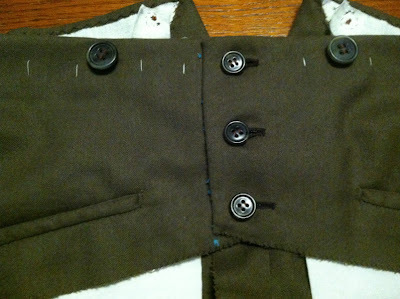 Lifting up the flap, I have my buttons marked out. 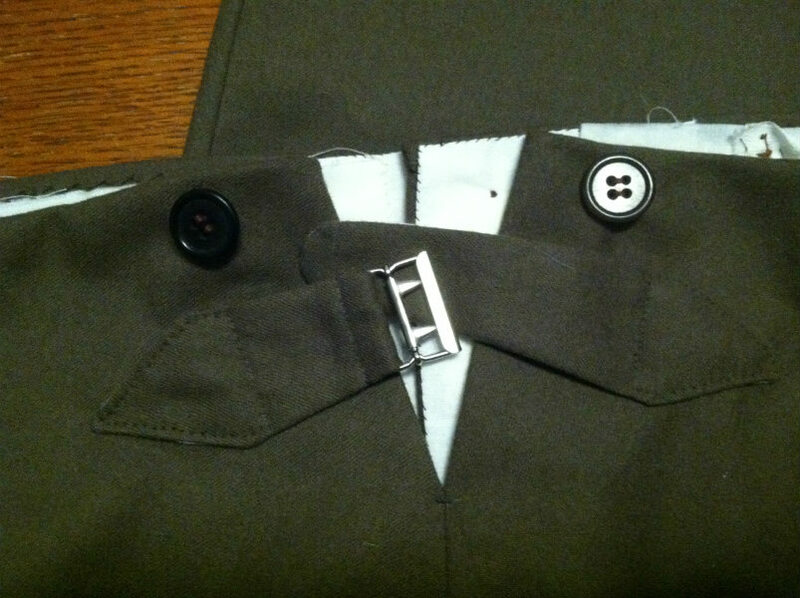 After sewing on the buttons, the flap fits perfectly. The fall buttonholes, marked out. 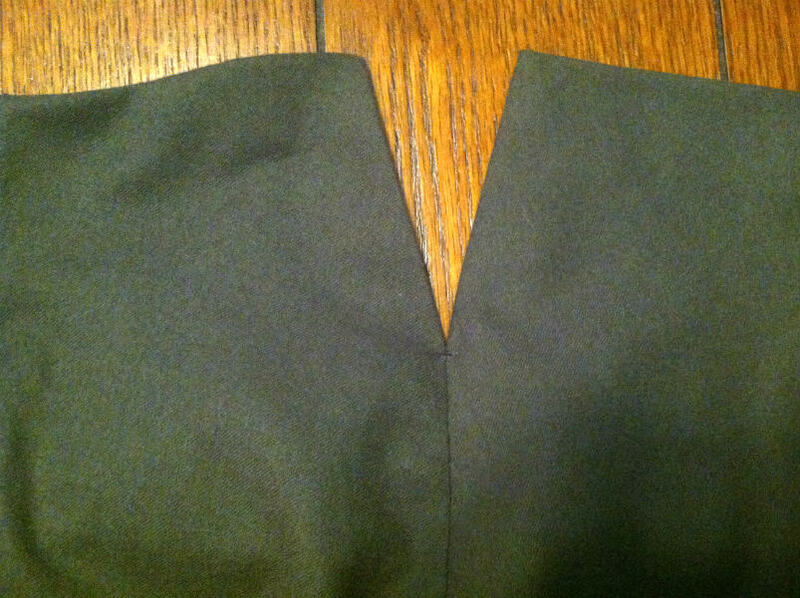 The two corners are done at angles, and the inside ones are vertical. Halfway through sewing a buttonhole. 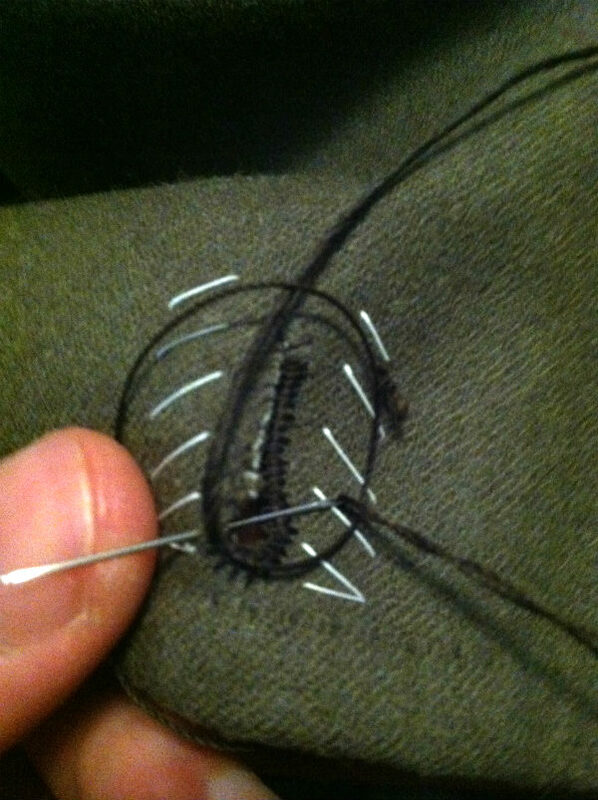 You can see my homemade gimp - four strands of buttonhole silk twisted together. 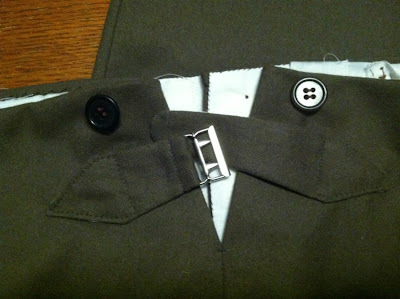 All buttoned up! Well this flap isn't going anywhere. 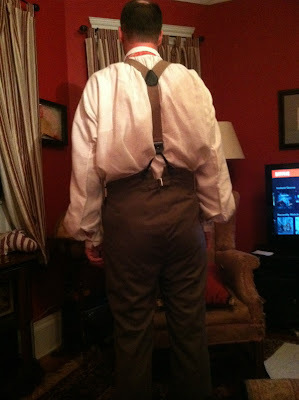 On to the adjustment straps. The white linen backs are cut out the same size as the cloth. 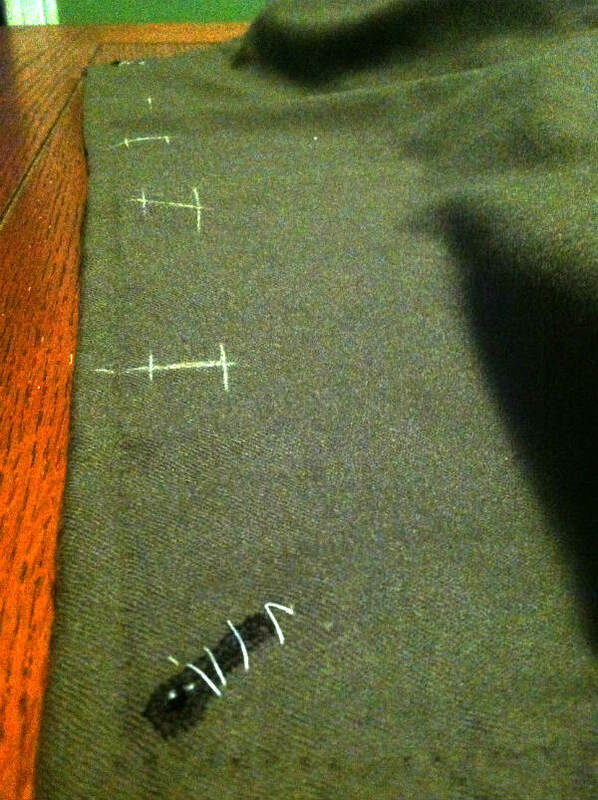 When basting them together I made the cloth fit inside the edge of the linen all around. This way when they're turned out the linen will be smaller than the cloth, and there will be a little overlap of cloth all around so the linen doesn't show in front. The adjustors sewn in place. 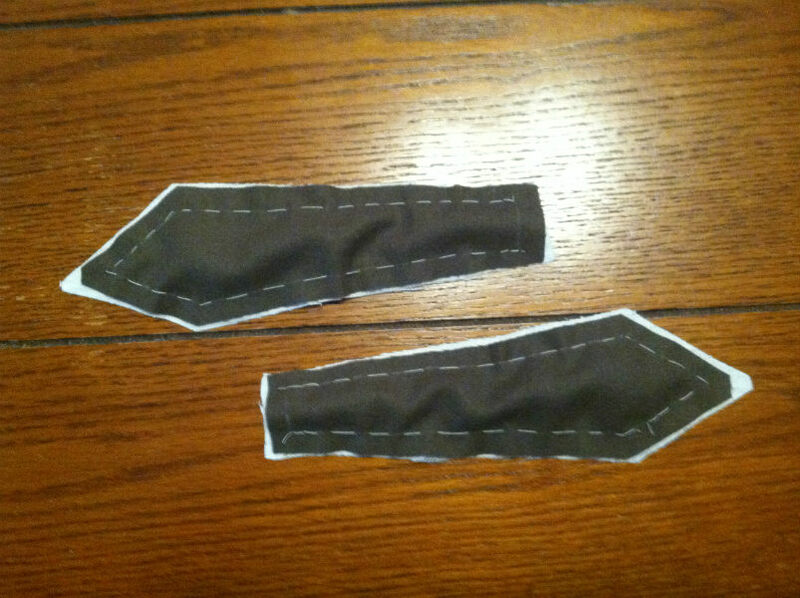 Finally two strips of lining fabric are sewn into the waistband. Early 19th century trousers apparently didn't have waistband curtain lining, so this is all I need to finish the trousers. The colours are really off in these last two photos. It was night time, and our living room light is very dim. 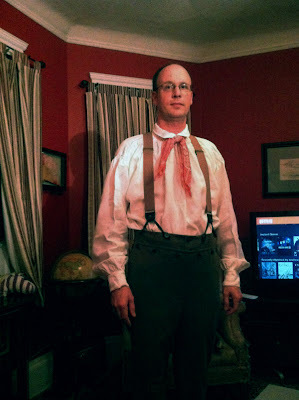 I'll have to get some better photos outside, but for now this will have to do. Simply Amazing! 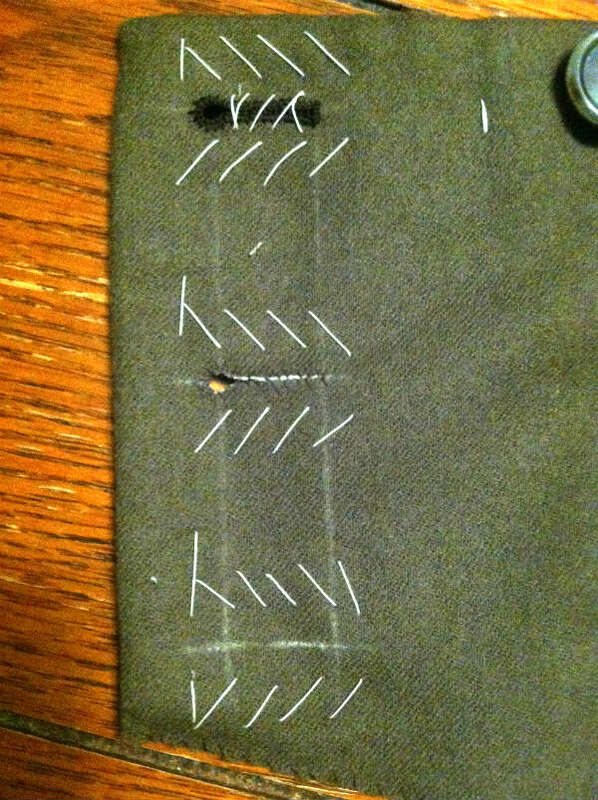 Great attention to,detail. Ich bin wirklich, wirklich beeindruckt! Chapeau, Monsieur! Mit lieben Grüßen aus dem Süden Deutschlands.